We love seeing our student’s finished projects. William started his tub shower combo project a few weeks back. There were some challenges, like the shower niches. 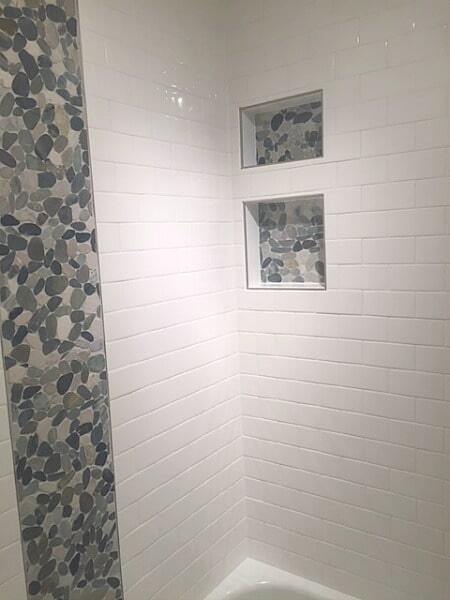 But in the end his new shower looks awesome and his hard work paid off! William’s project began with the waterproofing. He chose Wedi’s Tub Shower Kit because of the ease of use. But cement board or KERDI-BOARD are also great options. Our biggest tip for backer boards is to check the studs are even and level. Most backer boards require studs be 16 inches on center. So check that as well. 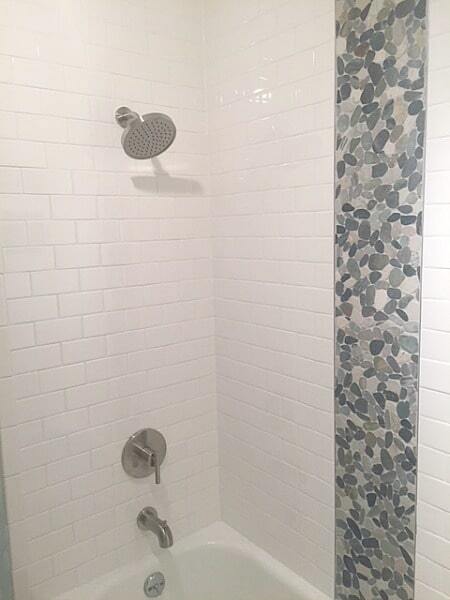 He chose subway tile with a stone accent. 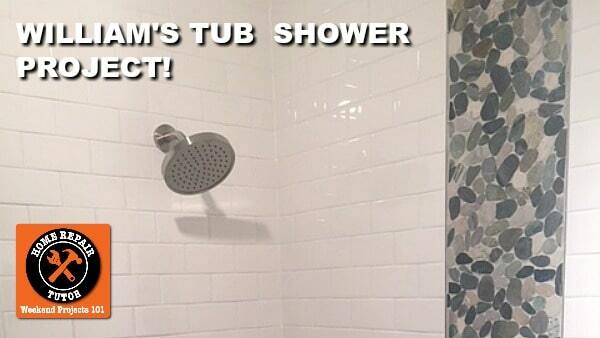 Notice how the tub spout and shower valve are evenly spaced. That’s exactly what you want in a tub shower combo. Also, the first and last row of tile shouldn’t be small slivers. William did an awesome job of planning his tile layout. Be careful when setting stone tiles. Sometimes stone tiles can look terrible when set as sheets, i.e. the transition between sheets is painfully obvious after grout. So it pays to have a second set of eyes look at the stone before it becomes permanently set. It’s a little hard to see, but he used Schluter metal profiles to picture frame the niches. Wedi is great because it can be used to create custom niches. Always have shower niches on an inside wall. Shower niches on outside walls are a bad idea. The tile and grout will be susceptible to massive expansion and contraction. This in turn can lead to cracks. Give Willliam some love down in the comments. P.S. If you’re doing a DIY bathroom remodel in 2018 check out Bathroom Repair Tutor’s Courses, you won’t be disappointed with the videos and one-on-one support. I’m just starting the tiling on my walk-in shower. If I had to start over, I would think twice about the niches–I decided to add three for my daughter’s family of 9 (yes, 9)!!! They are definitely the hardest part of the job. It’s amazing to have the resources and advice that Jeff and Steve so generously share though, right? I look forward to completing my project and sharing the pics with the group in the near future. Kudos, William! You ought to be feeling proud! Thanks Rose for your kind words. And I couldn’t imagine having a family of 9, very impressive. You’re a good Mom for helping revamp their shower!! William, that’s a beautiful job. You hit the ball out of the park on this one. I especially like the use of the stone in the niches. Nice decorative touch. Congrats, my man. You deserve a long vacation now. Couldn’t agree more Al, he does deserve some type of vacation. That stone is fantastic in the niches. Love that idea. You did a beautiful job, William. Hopefully it will be a tribute to you even long after you’ve hung up your construction belt. Totally agree Elizabeth, the bathroom itself is a great tribute to that hard work.